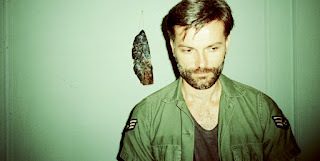 New Music Matters: New Fave Song From Porcelain Raft, "Unless You Speak From Your Heart"
New Fave Song From Porcelain Raft, "Unless You Speak From Your Heart"
For me, one of life's greatest thrills is the simple discovery a new favorite song. Like a child with a beloved toy, it stays with me throughout the day and I delight in showing it off to others. New music comes my way in many sources now... I still listen to my favorite radio shows online as often as I can (John in the Morning on KEXP Seattle from 9 am to noon EST and "Morning Becomes Eclectic" on KCRW in Los Angeles from noon to 3 pm EST) and if I hear something of note, I'll jot down info to revisit later. I'm also now on contact lists from my writing/reviews to receive music via emails and occasionally an actual CD in the mail. Keeping up with the influx of new bands on the scene is sometimes daunting, but at the same time it continually feeds my soul. A song by Porcelain Raft, "Unless You Speak From Your Heart," was featured on the KCRW music blog the other day and I was instantly captivated. Its wavering synth intro led into the fuzzed out musical landscape of dream pop, until female vocals entered with symphonic percussion similar to Beach House. This tune is the selected single off is the new release, Strange Weekend, and rightly so. The catchy melody drifts over the tightly-wound song structure, creating a worthy listen. Behind the scenes is composer Mauro Remiddi, an Italian ex-pat who is now based in New York City. He's on tour with Youth Lagoon, M83 and the Smith Westerns -- certainly good company to be around (and unfortunately, I just missed the NYC date). The video for the song is an arty black and white shoot of the band gamely trading places in front of a stark white background. They're not exactly playing any instruments, but it's nice to at least get a visual sense of the group. Many bands are opting out of this vehicle of communication with their fans and I was eager to catch a glimpse of the musicians behind my new fave song, so it did not disappoint. Plus the very next day KEXP picked another track from the album, the lead off track "Drifting In and Out," for their "Song of the Day." I had also picked this one for my next New Music Playlist, but I'm always happy to play fair and share. Girls Release New Video for "My Ma"
New Song/Video from Pretty Lights "We Must Go On"